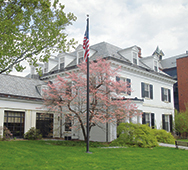 The board of directors provides guidance and leadership to the Office of Alumnae Relations at Smith College. Directors have a range of experience and expertise that benefits the AASC, the OAR and alumnae. I loved my Smith experience — especially the opportunity to balance intellectual rigor with tennis tournaments with my major advisor, becoming a competitive soccer player, being Chapin house president and a member of student government, and living with students whose life experiences were so different from my own. I was elected to Sigma Xi for independent research conducted with an Alfred P Sloan Foundation grant. My Smith years were transformative. I am honored to give back to this special institution.After Smith, I studied at the University of Pennsylvania and later was awarded a law degree from Catholic University.In the mid 1990’s as an AASC director, I worked with Smith Alumnae Quarterly staff to upgrade the SAQ, which received multiple national awards for imaginative editorial content and innovative design and became the gold standard for all alumnae publications. My career has been in media policy and regulation, and later creating program and business models at the intersection of new technologies, programming and online content. Over a 40 year period I’ve helped shape FCC rules enabling cable television to grow and innovate. As a senior executive at HBO, NBC, Time Warner, I led press and media relations, helped create CNBC and produced the Emmy award winning Metropolitan Opera live HD programming. Early in my career I worked on the creation of Sesame Street. As AASC Board president I look forward to expanding the board’s role in developing innovative opportunities that engage our diverse and global alumnae network in a meaningful lifelong relationship with Smith College. Lynne Zagami, 2000, is a leader in the conversation around how startups can deploy technology to improve and enhance their legal operations. She serves as the Head of Customer Success at Shoobx, a software platform that startups use to manage corporate legal activity. She leads the Shoobx client service team and participates in the company’s business development efforts. Previously, she created the role of Director of Client Engagement at Gesmer Updegrove, overseeing the firm’s marketing, business development and client service efforts, following several years as a corporate attorney serving startup clients. While at Smith, Lynne majored in Women’s Studies, studied psychology, and sang in the Glee Club and Vibes a cappella groups. She also holds a J.D. from New York Law School.Lynne’s community activities involve advocating for women startup founders. She served as Director of Community Engagement at SheStarts, an organization supporting women founders, and coaches teams in the Babson WIN Lab, an accelerator for women-run companies. She often speaks about gender issues in startup fundraising, including a TEDx talk, “We Can Make Things Better for Women Founders. Here’s How.”In addition to her current role as Vice President of the Alumnae Association Board of Directors, Lynne has worked on several projects supporting Smith student and alumnae entrepreneurs. She launched an entrepreneurs’ networking lunch series in Boston, organized visits for Smith students to Boston startups, has served on the selection committee for the Draper Competition, and has spoken about issues facing women entrepreneurs at the Women’s Leadership Conference. Hon. Stephanie D. Neely is the Managing Director, Head North America Institutional Central US and Canada Region for JPMorgan Chase Asset Management. Stephanie has spent 3 decades in the financial services arena. Most recently, she was a vice president and assistant treasurer of the Allstate Insurance Company, where she was responsible for the strategic direction and management of liquidity, capital, ratings, corporate finance and corporate structure issues. In addition, she was the chair of Allstate’s pension investment committees and a member of the 401 (k) investment committee.Prior to Allstate, Stephanie was appointed to serve as treasurer of the City of Chicago in December 2006, elected in February 2007 and re-elected to a second term in February 2011. As the treasurer of Chicago, she raised reporting efficiencies and reinvented the Office with innovative programs and community outreach, including Small Business Development Loans and financial literacy programs reaching more than 240,000 Chicago Public School students. Stephanie also managed the city’s $7 billion financial portfolio and consistently beat the 90-day Treasury bill benchmark while conducting 60% of trades with minority, women and disabled veteran broker dealers. She was also a trustee on all five city pension plans. Stephanie began her career as a financial analyst with Smith Barney in municipal finance and subsequently held municipal finance management positions at different firms in New York and Chicago, including First Chicago/Bank One. She was also a vice president of institutional sales at Northern Trust Global Investments. Stephanie earned an AB in economics from Smith College, where she currently serves as the treasurer of the AASC Board of Directors, is a member of the Investment Committee and was a recipient of the Smith Medal. She also holds an MBA in finance from the University of Chicago Booth School of Business. Heidi Novaes is responsible for marketing and financial product management for Capital Group’s Canadian asset management business. Heidi joined Capital Group in 1992 and was previously a financial writer and editor. She also leads a women’s group for associates across the company’s North American offices.Active in mentoring for teens and adults, Heidi offers outreach on college and career planning, building confidence, navigating widowhood, and saving and investing. She has been a fundraiser for students of color, women in STEM, and organizations such as Leukemia and Lymphoma Society and Vasculitis Foundation. She serves as a Smith admissions representative for Downtown Los Angeles high schools, volunteers in a neonatal intensive care unit, and serves on the board of the Ketchum-Downtown YMCA. Heidi lives in Downtown Los Angeles, where she sings in a choir and enjoys the arts community. Her daughter Anna is a Smith graduate (2011) and son Ricky is studying at University of Chicago. Lesli Ann Mie Agcaoili ’93 has forged a career in product development, leveraging design, engineering and business. As a Senior Design Quality Engineer at Tesla, she travels globally, supporting the launches of several new electric vehicles. Her career has allowed her to combine her varied interests: auto design at Ford Motor Company, hardware development at BlackBerry in Canada, fashion design, and education.In addition to her B.A. in studio art, and junior year studying environmental design and architecture at Parsons School of Design in NYC, she holds a B.S. from Art Center College of Design in transportation design and an M.B.A. from the University of Michigan focusing on corporate strategy and organizations. She furthered her studies in fashion at trade school in Los Angeles. As a public speaker and advisor, she is committed to help develop opportunities for others and enjoys connecting ideas and people. Lesli also enjoys work as an image consultant and makeup artist helping clients develop and amplify their personal style. Her Smith experience includes: Member of the AASC Board of Directors, Chair of the AASC Nominating Committee, Class Fund Agent, Class Reunion Volunteer, Smith CORP serving the San Francisco Bay Area, AAC for Detroit and for Ontario, Canada and Smith Club of LA Board Member. She enjoys engaging with current students and is a strong supporter of the Picker Engineering program and was a panelist at the opening of Ford Hall. While at Smith, Carrie double majored in Physics and Math, and subsequently earned a Master’s Degree in Computer Science from Fairleigh Dickinson University. Much of her career was as a Software Quality Engineer in military, commercial and space aviation and, in the early days, anti-submarine warfare. She published many articles on Software Quality, reliability and maintainability, and was a contributing member of an ISO committee on Software Quality. She then moved to managing Quality Systems for Johnson & Johnson, from which she retired in 2012. In addition to volunteering for Smith, Carrie is the president of her local orchid Society, Orchid Chair at the Philadelphia Flower Show, and a judge-in-training with the American Orchid Society. Elena works at UNICEF USA on the Foundation Partnerships team and is concurrently pursuing her MBA at Columbia Business School. She will graduate in May 2020, the same year as her ten-year Smith reunion! A grateful participant in Smith’s Fulbright program, Elena conducted Fulbright research on the barriers to secondary education in Malawi. Immediately after graduating from Smith, she and two Smithies founded a community mentoring program for gifted primary school students from outside Nairobi. Her civic work includes being a Global Shaper for the World Economic Forum and serving on advisory boards for Children’s Hope for Malawi and Masomo Mashinani Foundation. In her free time, she enjoys sampling smelly cheeses. Ja’Milla C.K. Lomas is a special events manager, communications specialist and “jack-of-most-trades” wrapped up in one petite package. Throughout her career, she has produced, designed or directed concerts, gallery openings, galas, promotional tours, conferences, festivals, and community events.From the political – working with Texas State Representatives or the U.S. Deputy Secretary of Commerce – to socially-conscious consumerism – managing logistics for Iron Man or Susan G. Komen Race for the Cure – Ja’Milla enjoys a dynamic career that has never proven dull.Chief among her volunteerism is her 19-year dedication to Delta Sigma Theta Sorority, Inc., one of the largest organizations of women committed to public service. Currently an Executive Board member and Arts & Letters Chair of her chapter, Ja’Milla strives to inspire active involvement in the arts. In her Smith College after-life, Ja’Milla has been active as an Alumnae Admissions Coordinator and class officer. Ja’Milla is now privileged to serve as a member of the AASC Board of Directors, where she enjoyed the responsibility of co-chairing the 2018 Women of Color Conference. Ja’Milla recently realized a lifelong dream when another Smith alumna recruited her to found a free, public school for under-served middle schoolers. The Étoile Academy Charter School ensures that every student has the foundation necessary to succeed in high school, graduate from college, and pursue ambitious life goals. Ja’Milla currently uses her experience championing the rights of the vulnerable, developing integrated marketing strategies for Texas’s largest Community Action Agency dedicated to lifting people out of poverty. Vickie Shannon, M.D. is a Full Professor of Medicine in the Departments of Pulmonary Medicine at M.D. Anderson Cancer and the first African American woman to be promoted to full professorship in the Texas Medical Center. Dr. Shannon is triple boarded by the American Board of Internal Medicine in the medical disciplines of Internal Medicine, Pulmonary Diseases, and Critical Care Medicine. She is a nationally recognized pulmonary scholar who has published extensively in areas of cancer-related lung injury. These publications have resulted in an extensive array of speaking engagements at local, national and international conferences.Dr. Shannon completed her undergraduate work from Smith College before matriculating from Washington University for medical school in St. Louis, Missouri. She completed three years of internship and residency training at the University of Texas – Houston then returned to Washington University for her fellowship training in Pulmonary and Critical Care Medicine. Dr. Shannon reflects on the years of service as faculty at M.D. Anderson Cancer Center which have been filled with remarkable peaks and valleys, and recognizes that both have brought her to this point in her career. “I entered medicine, as many of us did, planning to relieve suffering and heal the sick. Along the way I have discovered many ways to make contributions to medicine in addition to patient care.” She has served in many student leadership roles and on local and national boards, including chair of the Summer Experience program for first year medical students, the Alumnae Association of Smith College, and ACE Cancer Care. Among her more recent awards, Dr. Shannon was the recipient of the 2017 prestigious Smith College Medal and voted within the top 1% of physicians nationally by the Consumer Assessment of Healthcare Providers and Systems. Steffanie Garrett, Smith College class of 1988, is Deputy Corporation Counsel, Federal Civil Rights Litigation Division, for the City of Chicago Department of Law. Previously, she worked as a United Nations legal officer at the Khmer Rouge tribunal in Phnom Penh, Cambodia, litigation partner and Deputy Practice Group Leader with the Chicago office of Holland & Knight, and Cook County Assistant State’s Attorney in the Criminal Trial Division.Steffi is a longstanding Smith volunteer, having served twice on the board of the Alumnae Association of Smith College, as chair of the Network of Alumnae Admission Coordinators and chair of the AASC’s Nominating Committee, and has held several officer positions with the Smith Club of Chicago. She is currently the Planned Giving Chair for her class. Steffi’s pro bono and community service focuses on human rights and the arts, and includes serving on the Board of Directors of Planned Parenthood of Illinois, on the Leadership Council of the National Immigrant Justice Center, in leadership roles on fundraising and arts committees at the Lycée Français de Chicago, and as the second female President of the University Club of Chicago. Steffi received her A.B. in government and French from Smith College, studying in Geneva her junior year, and her J.D. from the Marshall-Wythe School of Law at the College of William and Mary. Steffi lives in Chicago with her husband and two sons. Ann Mitchell is the President and CEO of Montgomery Hospice, a non-profit hospice with over 300 employees in Rockville, Maryland. She also has worked for hospices in Greenfield and Waltham, Massachusetts and Greenville, South Carolina. Ann became a hospice administrator after she graduated in 1981 with a master’s degree from Yale University’s School of Public Health.In her 35-year hospice career, she has overseen the development of two inpatient hospices, one of which was designed for AIDS patients in the 1980’s.Before beginning her healthcare career, Ann was a researcher for the Yale (University) Center for Health Studies where she worked on a major federal grant analyzing Medicare hospital payment modalities. Motivated by her interest in research, she also was the principle investigator with researchers from Clemson University and the Greenville Health System on a study of hospice economics, which was published in the Journal of the American Medical Association (JAMA). As a student at Smith College, Ann majored in economics and minored in astronomy. After graduation, she worked in corporate lending for the Chase Manhattan Bank in NYC and Rio de Janeiro, Brazil. In 1976, she was the first American woman sent by Chase to work in a Latin American country, a place she was familiar with since she grew up in Caracas, Venezuela; Havana, Cuba; Panama City, Panama; and São Paulo, Brazil. Ann was born in Johannesburg, South Africa, and she graduated from high school in Manila, Philippines. Currently, Ann lives in Northern Virginia with her husband, Thomas Carroll. Sharmeen Obaid-Chinoy is the only female director to have been awarded two Academy Awards by the age of 37. Since 2001, she has made over two dozen multi-award films in over 16 countries around the world. Her films include Student Athlete, Girl in the River, Song of Lahore, Saving Face, Peace Keepers, and Transgenders: Pakistan’s Open Secret.In 2012, Time Magazine included Sharmeen in their annual list of the 100 most influential people in the world. That same year the Pakistan Government awarded her with their highest civil honor, Hilal-e–Imtiaz. In 2013, the Canadian government awarded her a Queen Elizabeth II Diamond Jubilee Medal for her work in the field of documentary films and the World Economic Forum honored her with a Crystal Award at their annual summit in Davos. In 2017 the International Center for Journalists awarded her the Knight International Journalism Award for her work that led to legislative change. In 2017, Sharmeen was the first artist to co-chair the World Economic Forum at Davos. Sharmeen holds a Bachelors degree from Smith College and two masters degrees from Stanford University. In 2018, Smith College awarded her an honorary degree in Fine Arts. Camille O’Bryant, Class of 1983 (AB) and class of 1986 (MS) is professor of kinesiology and associate dean in the College of Science and Mathematics at California Polytecnic State University in San Luis Obispo, CA where she teaches courses on the psycho/social aspects of physical activity, sports and gender and sport, media and American popular culture.Camille majored in French at Smith, earned a master’s degree in exercise and sport studies from the college, and a doctorate in sport, leisure and somatic studies from Ohio State University. She served as a director on the AASC Board in 2003-06 and is currently serving as an Alumnae Trustee (2015-2019). She was an active volunteer for admission (200-04) and continues her strong relationship with Smith’s athletic department. Virginia Choi graduated with a philosophy degree from Smith College. She is currently a PhD student of Social and Organizational Psychology at the University of Maryland, College Park. She researches the influence of culture and social norms on discriminatory attitudes and organizational effectiveness.Prior to her doctoral studies, Virginia worked in marketing within the non-profit sector and she worked as a journalist for several years.In addition to her current volunteering role with the Smith College Alumnae Association, Virginia served as the VP of Communications for the D.C. Smith Club from 2015 to 2017. She also served as the 2009-2010 President of Smith College’s Student Government Association. Leah Gross graduated from Smith with a degree in American Studies, spending her junior year in Washington, D.C. at the Smithsonian Institution. She has spent the last seven years working as a Sales Tax Analyst for Eaton Corporation where she was recognized as a Pinnacle Performer for her work reducing Eaton’s audit exposure and standardizing customer exemption certificate collection.In 2013 she was given a Smith College Club Volunteer Award by the college for her work with the Pittsburgh Smith Club. She re-ignited the club after a hiatus, starting with a book club which remains active after 7 years. Additionally, she helps to organize the club’s annual holiday party, spring speaker events, happy hours, and other social activities for local Smith alumnae. She’s also led an online webinar for the Alumnae Association, giving tips to other alums on how to either start a new alumnae club or resurrect an old club.In addition to her Smith volunteer work, she serves on the leadership team for her employer’s Pride group, a new group working to improve awareness and inclusion for the LGBTQ community. She’s also treasurer for the Pittsburgh chapter of Frontrunners, an international LGBTQ running club, and on the social committee for her condo association. She lives in Pittsburgh, in an apartment previously owned by a Vassar alum who later taught at Wellesley. The Seven Sisters spirit is alive and well in her home! Jena Heath, ’84, is an Associate Dean in the School of Arts & Humanities at St. Edward’s University and an Associate Professor Journalism & Digital Media. She is also Program Coordinator for Journalism & Digital Media and a veteran journalist who spent twenty years as a reporter and editor before joining the faculty in 2008. As a reporter, she covered police, courts, local, state and federal government and politics. She covered the 2000 George W. Bush campaign and the Bush White House for the Austin American-Statesman/Cox News.Jena’s ongoing oral history project, Our China Stories, is a collection of interviews with people adopted from China. She helped facilitate the launch of a Mandarin Immersion language program in the Austin, Texas public schools and is the mother of a daughter from China. In addition to her work on the Nominating Committee, Jena serves as the Admissions Alumnae Coordinator in Austin. Aura Sujaritchan Novembre ’93 has served as a Nominating Committee Vice-Chair, Smith Fund volunteer, social media ambassador, class of ’93 social media chair, alumnae admission volunteer for multicultural recruitment, and head of the professional women’s committee for the Smith College Club of New York.Having spent over 15 years licensing content in start-up environments, Aura is the Jill-of-all-trades at ACI Information Group, a technology start-up that aggregates content for the academic and corporate research markets. Her role as Vice President of Content spans licensing, sales, customer relations, operations, project management, marketing, human resources, and department supervision. Aura has achieved her version of a harmonious work-life balance within a virtual office environment. The ability to work remotely affords her the pleasure of playing with the latest online collaboration tools and gadgets, along with the privilege of picking up her daughter from school and discussing the day together. Having to keep up with the latest social media trends for the business, she has become quite adept in that space and enjoys using it for “good” – such as promoting ideas, people and organizations in which she believes. Previously Aura dabbled in the television and film development worlds – drifting through both independent and Hollywood producers’ offices – where she learned how to troubleshoot errant scripts (and copy machines). In her spare time, she finds meaningful purpose volunteering for schools – both her childrens’ and her alma mater. Aura lives in lower Manhattan with her husband, two daughters and a furbaby. Nikki Radford ’04 is an environmental scientist for the US Environmental Protection Agency, serving for ten years as a Clean Air Act inspector, case development officer, technical authority, and state/local enforcement program liaison. She was in the first class of engineers to graduate from Smith College. She has masters’ degrees in environmental science and public affairs from Indiana University. She has served in various capacities for the Smith College Club of Atlanta including as Alumnae Admission Coordinator for the last 4 years. Her civic works include AmeriCorps, National Civilian Community Corps, alumni; Kessler City Lofts Condo Association, Secretary and Communications Committee chair. In her spare time, she volunteers and performs improv comedy at the Village Theatre in Atlanta, Georgia. Brittain graduated from Smith with a degree in English and holds a Masters in City and Regional Planning from Georgia Tech.She served her class as Secretary from 2010-2015, and is currently a member of the Bluegrass Area Smith Club and the Smith Club of Louisville. Brittain is a Commercialization Director for EnterpriseCorp, assisting entrepreneurs building and scaling tech-based startups in the Louisville area, and has prior work experience in economic development and urban planning. She co-founded and produced The Kentucky Dirty mud run and has over two decades of volunteer work with Presbyterian youth programs. In 1981, Mary Tondreau founded TvT Associates, Inc., a Washington, DC-based technical and advisory services firm where she served as president and CEO until 2002. During that period, Mary grew the company from 3 employees to over 50 full-time and 150 intermittent contract staff working internationally on public health projects. Under her leadership the company became a successful competitor for federal contracts focusing on the planning, design and evaluation of HIV/AIDS, reproductive health, and maternal and child health programs worldwide.Social & Scientific Systems, Inc., of Silver Spring, Maryland, acquired TvT Associates in 2002. Following the acquisition, Mary served as a senior vice president and division director until 2004 when she was named Chief Administrative Officer and she continued in that role until her retirement from Social & Scientific Systems in December 2006. Following her retirement, Mary served on the Board of Directors of Social & Scientific Systems through 2016 and for six years she chaired the Leadership Development (compensation) Committee. Mary graduated from Smith in 1980 as an Ada Comstock Scholar. She has been an active alumna volunteer including a term as president of the Ada Comstock Scholars alumnae, service on the Classes Committee and in 2018 she joined the AASC Nominating Committee. Other current volunteer work includes serving on the Board of Directors of Ashby Ponds retirement community and on the Governance and Internal Affairs advisory committee of National Senior Campuses. Mary lives with her husband, Ted, in Ashburn, VA.